We were in Quito for a two day stopover prior to joining our Silversea Cruise to visit the Galapagos island on their ship, the Silver Galapagos. This stopover is offered as part of a package prior to the cruise and breaks up a long and rather arduous journey to get to the remote Galapagos Islands. Having left our home in the very early hours and made a connecting flight from our local airport to Amsterdam we then embarked on a 12 hour flight to Quito airport where we were met by a Silversea representative who accompanied us on our journey to the hotel. Just as our plane was landing at the airport there had been a massive hail storm and heavy rain causing minor flooding and disruption, meaning that, along with the rush hour traffic, our 40 minute journey to the hotel took almost two hours! By the time we arrived at the hotel the light had faded and we were flagging. Thankfully upon arrival at the hotel we were greeted with a lovely hot towel to refresh ourselves and local hot fruit drink, which we enjoyed before being shown to our room on the 7th floor. Being jet lagged and without our luggage (which had been delayed in Amsterdam) we were delighted to be greeted by a lovely, large double room with a gorgeous bathroom and a view over the hotel pool. The room was beautiful with a sleek, shiny wooden floor, large double bed, comfortable arm chair and footstool, coffee station and wardrobe housing robes, a safe, an ironing board and iron. The bathroom was huge, housing a separate shower, large oval shaped (very inviting looking) bath and a separate toilet. All of your bathroom and toiletry needs were provided. The little in-room coffee station. We loved this (very comfortable) seat and footstool. We quickly refreshed ourselves (this didn’t take long seeing as we had no spare luggage) and made our way down to the bar to get something to eat. The bar was located just off of the main atrium and was light and nicely decorated with alcove type seating. The staff were attentive and friendly and we ordered the local potato soup and a plate of burritos. The local soup had been recommended to us and was just what we needed after a long and tiring day, big chunks of potato and cheese in a creamy soup with slices of avocado in it. Proud to have made it to almost 9pm (1am to us) after almost 22 hours of travelling and with our hunger satiated we went straight back to our room and our very comfortable bed, both falling straight to sleep. However, this didn’t last long and at 1am jet lag decided to catch up with us, keeping us both awake for a couple of hours. Despite this interruption to our sleep we both managed to get another couple of hours sleep before hunger again woke us and the hotel breakfast tempted us downstairs. Ecuadorian potato and cheese soup. The smoothie bar menu wall. Breakfast was a lavish affair with an array of hot and cold foods, pastries, breads, exotic fruits and a rather wonderful smoothie bar. After a very leisurely breakfast and a few cups of coffee we had a quick wander around the hotel, admiring the lovely outdoor pool and gardens and well equipped gym, knowing we wouldn’t be able to use either of them since we only had the clothes we stood in! Before making our way back to our room to decide what to do for the day we stopped of at the Silversea desk, located in the main atrium, and staffed throughout to assist passengers staying at the hotel as part of the pre-cruise package. Taking advise from the staff on the desk we decided to visit the equator lines and booked ourselves onto one of the excursions on offer to visit the volcanic crater located just on the outskirts of Quito and the ‘old’ and ‘real’ equator lines. The inviting looking outdoor pool. The gym and spa entrance. An hour or so later we met our guide and fellow travellers in the hotel lobby ready for our expedition. Our guide, Fernando, showed us to our minibus and we made our way out of Quito city towards the Pululahua Geobotanical Reserve. This huge volcanic crater was an awesome sight, treating us to rolling clouds coming in from behind the volcano against the backdrop of the fertile farming land below. Following a quick photostop and time to take in the magnificent view we made our way back to the minibus for our drive to the ‘real’ equator which is a run as a local museum. Upon arrival visitors are allocated a tour guide who takes them round the museum giving them some of the history of Ecuador before taking them to the equator line. Here the usual photo opportunities exist before the scientific fun starts, consisting of gravitational tricks such as water draining down a plughole (anti-clockwise in the Southern Hemisphere and clockwise in the Northern), walking along the line with your eyes shut without losing balance, testing strength which reduces when standing on the equator and balancing an egg on a nail, which apparently can only be done on the equator! Pululahua Geobotanical Reserve volcanic crater. You can only balance an egg on the equator apparently! 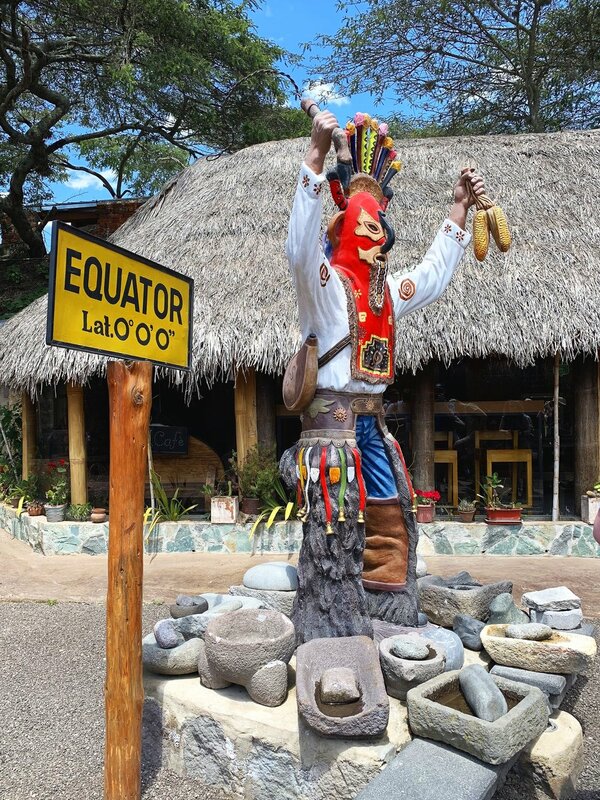 After leaving the equator museum we made our way to the site of the original equator line which is marked by a large monument. This line is only a few hundred feet south of the ‘real’ line and marks the spot of the original scientific research identifying the equatorial line in the late 1700’s. Given that until that point mankind had presumed the earth to be flat and these scientists had no access to modern day satellites and GPS it really is remarkable that they were as accurate as they were. With our excursion over we made our way back through Quito to our hotel in time to grab a quick late lunch followed by a very welcome siesta. Our delicious hotel bar lunch. Later that day, Silversea had arranged a coach tour of Quito taking in some of the old town, so just before 5pm we made our way down to the atrium to wait for the tour to start. The hotel atrium is a lovely place to sit and people watch with some very comfortable seating and a lovely glass roof letting in light and heat. When everyone had arrived we joined our tour guide and boarded a minibus for this early evening tour of Quito, travelling through the commercial district of Quito in order to get to the old town whilst our excellent tour guide entertained us with stories of Quito’s history as well as insight into what it is like to live in Ecuador today. The tour took us passed many of the historic buildings and churches, as well as a walking tour through the main streets and squares of the old city. By the end of our walking tour the light was fading so we re-joined our minibus to make our way up to the focal point overlooking the city, an aluminium statue of a Winged Virgin Mary which sits on top of the hill overlooking the whole city. After a steep climb up the mountain side we parked under the statue allowing us to take in the marvel of the statue itself and the most wonderful view of the city lit up in the now darkness. Beautiful flower display in the hotel lobby. The Winged Virgin of Quito at night. After a short drive back to the hotel we once again settled in the hotel bar for a bite to eat. As we were eating we were interrupted by the wonderful Silversea rep who tracked us down in the bar to tell us that our luggage had just arrived at the hotel. With the relief of knowing our luggage had at last arrived we retired to bed as we had a 4.30am wake up call for our early flight to the Galapagos the next day. We needn’t have worried about missing our wake up call, jet lag crept up on us both at about 3am. Knowing it wasn’t worth fighting since we had an early start anyway we both got up and got ready for the next leg of our Galapagos journey. Our stay had been short but we fell in love with this beautiful city and its lovely people, made all the more special by our rather luxurious and delightful base, the JW Marriott. If you would like to read more on Silversea Cruises why not take a look at our ship tour and review on the Silver Wind. With enormous thanks to Silversea Cruises for inviting us on this trip of a lifetime to the beautiful city of Quito and the jaw-dropping islands of the Galapagos. Helen is the sensible and grown up half of Visitwith.us. She tends to keep Rich in check. A lot. Mind you, he does deserve it.